Latest product from Ellusionist looks to make it big on KICKSTARTER in time for the holidays. The viral product experts at Ellusionist.com have created a new fidget toy sure to revolutionize life for fidget devotees everywhere. The Fiddle Stick is a modular fidget toy which is suitable for all ages, and enables all kinds of incredible new moves. US-based creators Ellusionist have already made a name for themselves as inventors of amazing gadgets designed to add a little extra flair to boring every day life. The Pyro mini, an earlier creation, went viral in 2015 after providing owners with the opportunity to shoot fireballs from their wrists at some 30 feet. 2017 sees a new direction for the company, with the Fiddle Stick seeking backers via the Kickstarter crowdfunding platform so they can get this completely modular toy into production. With the potential to start a hot new trend, there’s simply no other product available like it – from the first-in-market patent pending loop, to the fully modular design available in a range of colors, giving customers a chance to express their personality as well as show off some cool new tricks. 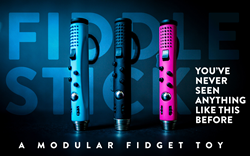 Whether users want to flip, spin, glide or slide their fidget spinner, the Fiddle Stick makes it all possible, acting like a one-handed set of nunchucks ready to transform the everyday fidget spinner into something much more dynamic. The Fiddle Stick is easy to master in minimalist mode, with nine features sure to satisfy even the most enthusiastic fan. With a soft swivel joystick perfectly placed for thumb positioning, and a loop which allows users to spin the device around and show off some amazing flips and tricks, this high-gear fidget toy also comes with a fidget spinner attachment for added high-octane moves. Meanwhile a dot matrix, worry stone and smooth slider help facilitate stress relief even when users must be discrete, making it the ideal companion for school, work and play. Find out more about Fiddle Stick and how you can support the Kickstarter campaign here.